Japanese Episode DP 028: "Fuwante and the Messenger of the Northern Wind!" 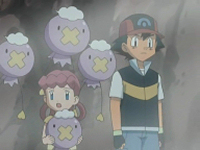 American Episode 492: "Drifloon On The Wind!" Satoshi and his friends are hungry, so they stop by a Pokemon Center on the way to Hakutai City. When they arrive, they are startled to see a Center that looks more like a house than a pokemon hospital! Inside, a Joi and her daughters, Sayaka and Mai, give Satoshi-tachi some food, so in return, the trio offer to help out around the Center. As they're cleaning, Sayaka notices that her father, who works at Valley Powerplant, had forgotten his lunch. So, she calls on her Fuwante to help carry her to her father's location. As Sayaka is being carried on the wind, Mai is told to feed cookies to the pokemon in the forest. Once she's out of her mother's earshot, she tells Satoshi that the legendary pokemon Suicune resides in the area! Once they return from the forest, a storm begins to brew. Mai is worried about her older sister, so she grabs onto a Fuwante and attempts to ride toward Sayaka's location. However, the wind carries her in the wrong direction! Everyone else gathers at Valley Powerplant to figure out what to do, but an impatient Satoshi takes Sayaka's Fuwante and rides the wind toward the valley. As everyone else follows by car, Sayaka runs to the lake in the forest to ask for Suicune's help. As Sayaka pleads with the legendary pokemon, Satoshi finds Mai and starts to guide her toward safety. Due to the storm, however, Satoshi and Mai slip and fall into a valley! They are rescued, however, by Suicune and Sayaka, who arrive just in time to catch the falling children. At that time, Joi and the others arrive on the scene, happy to know that Mai is safe. As our heroes make their way down the mountain, they wonder what other legendary pokemon they'll encounter on their journey. "It tries to bring children to the underworld by pulling onto their hands, but it gets swung around instead." So what does the anime do with a pokemon who has as great a backstory as this? Why, what else? Have it sit there and do nothing!! So there's the ridiculousness of Fuwante having as much of an impact to the plot of its debut episode as Whale'oh did in its debut, but what about Suicune? Well, if you're unfamiliar with the movie My Neighbor Totoro, then its appearance in this episode is just as random. But for those of you who have seen the movie, you'll notice the similarities everywhere. Just substitute Sayaka with Satsuki, Mai with Mei, and the scene where Sayaka asks for Suicune's help with the scene where Satsuki asks for Totoro's help, and the Ghos at the beginning of the episode with the makuro kurosuke ("dust bunnies") and BAM - instant Miyazaki movie. Paige's voice in the dub annoyed the crap out of me. It was like they took the VA of Mei from the first dub of My Neighbor Totoro (aka "the not good one") and told her to crank the annoying-ness up even more. The Japanese voice wasn't my favorite or anything, but there was at least a hint of cuteness there. Paige's voice, on the other hand, has absolutely nothing redeemable about it. Fuwante, Suicune, and Denryuu keep their Japanese voices. The ending theme from the first Pocket Monsters series, the impossible-to-spell Pokettaari Monsutaari, can be heard in the Japanese version. It plays from the time Mai agrees to go out into the forest and feed cookies to the pokemon until she starts telling Satoshi about Suicune. The dubbed version, of course, replaces this with instrumental music. The TO BE CONTINUED... screen has three seconds added to it. In case you didn't know.